They are both in central Edinburgh within walking distance of Edinburgh Waverley train station and Edinburgh bus station. Please note that Edinburgh is a very hilly city; it is an uphill walk from these transport hubs to the venues. 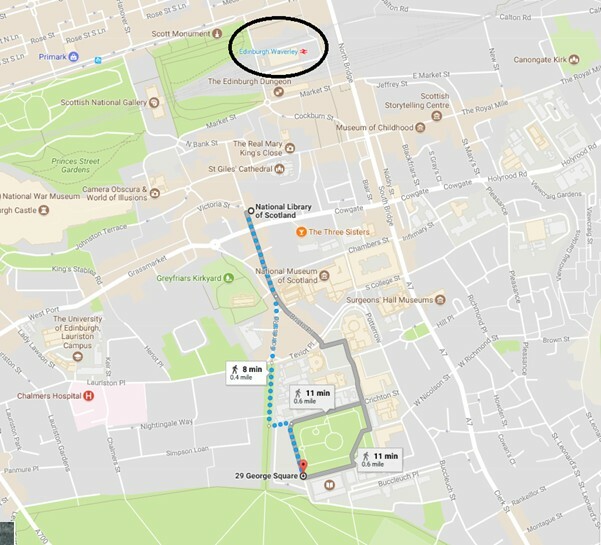 Walking between the School of Scottish Studies Archives and the National Library of Scotland on the Saturday morning should take around 10 minutes – 8 minutes’ walk apart according to this Google map (also shown below). If you have any specific questions you’d like to ask a local, feel free to contact Amy McDonald (Connecting Scotland’s Sounds) on a.mcdonald@nls.uk or Cathlin Macaulay (School of Scottish Studies) on cathlin.macaulay@ed.ac.uk.